32,688 unique visitors since July, 2015. My last editorial focused on building out a small application using a simple Service Locator Pattern, which exposed a number of cons whenever the pattern is used in isolation. As you might recall, one of the biggest problems that developers and architects have with this pattern is the way that service object dependencies are created and then inconspicuously hidden from their callers inside the service object register of the Service Locator Class. This behavior can result in a solution that successfully compiles at build-time but then inexplicably crashes at runtime, often offering no insight into what went wrong. 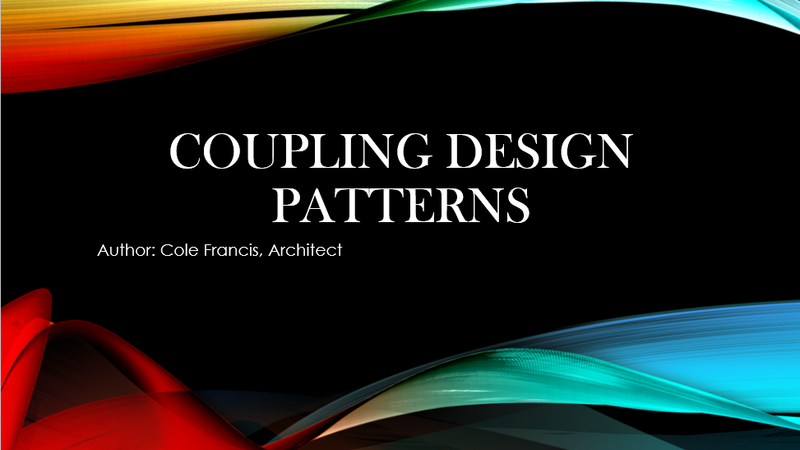 I think it’s fair to say that when some developers think about design patterns they don’t always consider the possibility of combining one design pattern with another in order to create a more extensible and robust framework. The reason why opportunities like these are overlooked is because the potential for a pattern’s extensibility isn’t always obvious to its implementer. For this very reason, I think it’s important to demonstrate how certain design patterns can be coupled together to create some very malleable application frameworks, and to prove my point I took the Service Locator Pattern I covered in my previous editorial and combined it with a very basic Factory Pattern. Combining these two design patterns provides us with the ability to clearly separate the “what to do” from the “when to do it” concerns. It also offers build-time type checking and the ability to test each layer of the application using an object’s interface. Enough chit-chat. Let’s get on with the demo! (1) A luxury model named “The Drifter”. (2) A sport luxury model named “The Showdown”. As you can see from the code above, both subtype classes inherit from the Vehicle() Base Class, but each subtype implements its own distinctive interface (e.g. IDrifter_LuxuryVehicle and IShowdown_SportVehicle). Forcing each subclass to implement its own unique interface is what ultimately allows a calling application to distinguish one vehicle type from another. Additionally, it’s the Vehicle() Base Class that calls the CreateVehicle() Method inside its Constructor. But, because the CreateVehicle() Method in the Vehicle() Base Class is overridden by each subtype, each subtype is given the ability to add its own set of exclusive parts to the list of parts in the base class. As you can see, I’ve hardcoded all of the parts in my example out of convenience, but they can originate just as easily from a data backing store. In object-oriented programming (OOP), the Dependency Inversion Principle, or DIP, stipulates that the conventional dependency relationships established from the high-level policy-setting modules, to the low-level dependency modules, are inverted (i.e. reversed), creating an obvious layer of indirection used to resolve component dependencies. Therefore, the high-level components should exist independently from a low-level component’s implementation and all its minutia. DIP was suggested by Robert C. Martin in a paper he wrote in 1996 titled, Object Oriented Design Quality Metrics: an analysis of dependencies. Following that, there was an article that appeared in the C++ Report in May 1996 entitled “The Dependency Inversion Principle” and the books Agile Software Development, Principles, Patterns, and Practices, and Agile Principles, Patterns, and Practices in C#. The principle inverts the way most people may think about Object Oriented Design (OOD), and the Service Locator pattern is an excellent pattern to help demonstrate DIP principles, mainly because it facilitates a runtime provisioning of chosen low-level component implementations from its higher-level componentry. An interface is created, which identifies a set of callable methods that the concrete service class implements. A concrete service class is created, which implements the interface. The concrete class is the component where all the real work gets done (e.g. calling a database, calling a WCF method, making an Http POST Ajax call, etc…). A Service Locator class is created to loosely enlist the interface and its corresponding concrete service class. Once a client application requests to resolve an enlisted type, then it’s the Service Locator’s job to resolve the appropriate interface and return it to the calling application so that the service class’s method(s) can be called. /// A textbook implementation of the Service Locator Pattern. If you look at the all the sections I’ve highlighted in yellow, all I’m doing is declaring a Dictionary Object to act as a “registry placeholder” in the Member Variables Region, and then I’m preloading the interface and service class as a key/value pair to the service registry in the Constructor(s) Region of the code. The key/value pairs that get stored in the Dictionary Object loosely describes the concrete class and its corresponding interface that gets registered as service objects (e.g. “IMyClass”, “MyClass”). An interface describes the methods and properties that are implemented in the concrete class, and the concrete class is type where all the real work gets accomplished. In its most primitive form, the primary job of ServiceLocator class is to store key/value pairs in a simple Dictionary object and either register or resolve those key/value pairs whenever it’s called upon to do so. The section that’s color-coded in green denotes simple getter and setter-like methods that are publicly exposed to a consuming application, allowing that consuming application to either register new service objects in the Dictionary Object registry or resolve an existing service object in the Dictionary Object’s registry for use in a client application. Although the Service Locator Pattern is not considered to be a lightweight pattern, it’s still very simple to learn and is easily explainable to others, which means that your junior developer’s eyes won’t pop out of their heads when you attempt to explain the concept to them. This truly is a framework pattern that you can teach a less knowledgeable person over a lunch hour and expect them to fully understand when you’re done, because the Service Locator framework wires everything up using an minimal number of resources (e.g. a Dictionary object containing key/value pairs and the ability to read from and (optionally) write to the Dictionary object). The Service Locator design pattern allows you to quickly and efficiently create a loosely coupled runtime linker that’s ideal for separating concerns across the entire solution, as each type is concerned only about itself and doesn’t care what any of the other components do. The services (i.e. Key/value pairs that represent concrete classes) that get registered in the Service Locator object are often considered “black box” items to consumers of the Service Locator class, meaning service objects and their dependencies are completely abstracted from the applications that call it. This loosely coupled structure makes it extremely difficult to track down issues without development access to the source code for not only the Service Locator itself, but also all of the dependent service objects that get registered by it at runtime. If you find yourself in this situation and you don’t have access to the Service Locator source code, then tools like the Microsoft ILDasm or the RedGate’s .NET Reflector are occasionally able to shed some light on what’s going on inside the Service Locator assembly; however, if the code happens to be obfuscated or if hidden dependencies are completely unresolvable, then deciphering issues can become an exercise in futility. 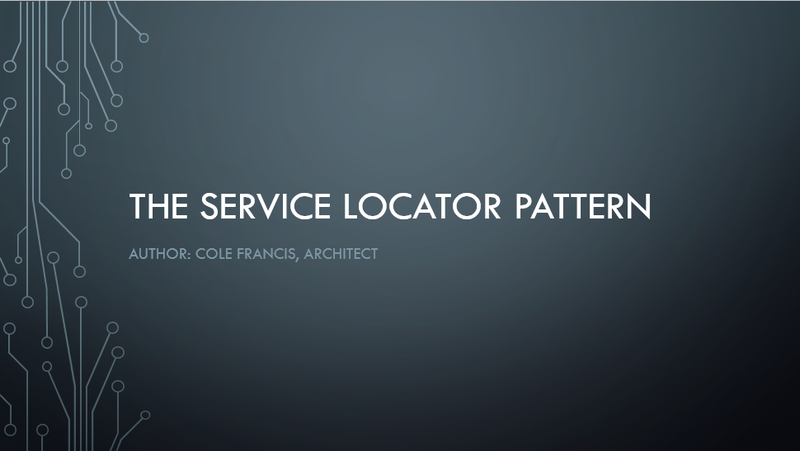 For this very reason, the Service Locator Pattern violates ACID Principles, which is why some architectural gurus consider the Service Locator design to be more of a design anti-pattern. Because Service Locator’s dictionary is constructed using a key/value concept, all key names must be unique, meaning that it’s not very well-suited for distributed systems without adding more validation checks around the Register method’s dictionary insertion code. Testing the registered objects becomes a difficult process because we aren’t able to test each object in isolation, as registered service objects are considered “black box” items to both the Service Locator and its callers. As I previously mentioned, objects are “late-bound”, which means that a caller is going to burn up some CPU cycles waiting the Service Locator to find the service’s registry entry in the Dictionary object and return it to them, and then they still have to invoke that object “late-bound”. Sure the time is minimal, but it’s still time that isn’t being spent on enhancing something more valuable…like the user experience. There are also some concerns from a security standpoint. Keep in mind that my ServiceLocator class allows people to dynamically register their own objects at runtime (see the code snippet below). Who knows what types of malicious service objects might get registered? What if our ServiceLocator class only performed a minimal set of validations before executing a method on a service object? Now that’s an awfully scary thought. As you can see, the Service Locator Design Pattern is very simple to explain and understand, but it certainly isn’t a “one size fits all” design pattern, and a fair degree of caution should be exercised before choosing it as a framework to build your solution on. You might even consider coupling it or substituting it with a more robust pattern, like one that offers the same capabilities but resolves its dependency objects at build-time instead of runtime (e.g. Dependency Injection).